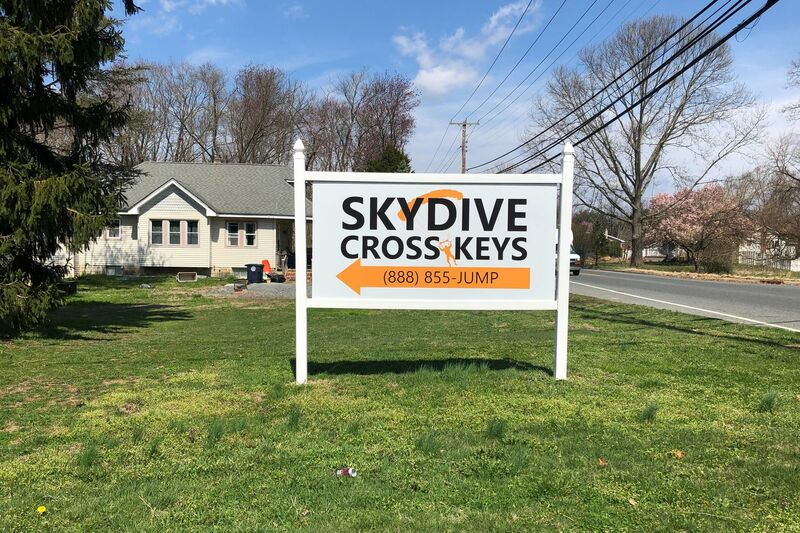 A sign for Skydive Cross Keys in Gloucester County, New Jersey. Paul Haaf Jr. was 40 when he tried skydiving for the first time, said his mother, Dianne. It was a tandem jump with an instructor paid for by his then-wife as a birthday present. “He just loved the freedom of being in the sky,” Dianne Haaf said Monday. To the horror of witnesses, Haaf hit the ground about 5:15 p.m. on Brookdale Boulevard in the Williamstown section of Monroe Township, officials said. He had jumped from a plane that took off from the nearby Cross Keys Airport in Williamstown. The Gloucester County Prosecutor’s Office and the Federal Aviation Administration were investigating Haaf’s death, which was ruled an accident by Gerald Feigin, the county medical examiner. It was at least the 10th fatality since 2002 for skydivers jumping from planes that took off from Cross Keys Airport, including one involving two skydivers who collided in the air, records show. On Sunday, residents in the quiet neighborhood about two miles from the airport said they saw a shredded parachute falling across a backyard and heard a loud noise when the skydiver landed on the ground in a median area. His main parachute was not attached to him, said Sharon Spera, who lives a block away. “He just came straight down,” said Spera, 71, a retired school secretary. Haaf’s Facebook page showed his love for skydiving. There was an outpouring of messages at the news of his death. “You will be missed greatly my brother Paul Haaf. Blue skies,” one person wrote. Paul Haaf Jr., 54, of Monroe, an experienced skydiver died in an skydiving incident, Sunday, April 8, 2019. Dianne Haaf said her son was “very safety conscious” and packed his own chutes. The last time she saw him jump was several years ago, and she never felt worried, she added. “He’d just land on his feet and just walk away from it,” she said. Haaf grew up with a brother in the house where his parents live in the Timber Lakes section of Monroe Township. He had one adult daughter and most recently worked at an Acme Market, his mother said. He had physical difficulties, which his mother did not specify, and recent surgeries, but that did not deter him from his love of skydiving. “It was something that captured his imagination,” she said. The accident investigation will likely center on the parachute. The FAA said it would conduct a review of the parachute, standard procedure when there is a fatality. Tom Gilbert, a spokesperson for the Prosecutor’s Office, said Monday Haaf apparently had difficulty deploying his main parachute and disconnected it. Haaf activated his auxiliary parachute but was falling too rapidly for it to let him land safely. On Tuesday morning, Gilbert said the main parachute was found Monday afternoon after a State Police helicopter spotted it in a wooded area near the Atlantic City Expressway, about a mile from where Haaf landed. “We’re still trying to explore the unfortunate chain of events. It does look like he made the best effort he could,” Gilbert said. There was little activity Monday at the airport, where two small planes sat near the runway. No one answered at the office. John Eddowes, owner of Skydive Cross Keys, did not respond to a request for comment. A skydiver killed in an accident Sunday in South Jersey jumped from a plane from Skydive Cross Keys at the Cross Keys Airport in Williamstown. About 15 miles south of Philadelphia, the airport is privately owned for public use. It is considered a mecca for skydiving enthusiasts, although it has also gained attention over the years for accidents and fatalities. Most of the victims were described as experienced skydivers and included an immigrant from Ukraine who lived in Brooklyn, a 62-year-old Bala Cynwyd man, and a mayor from Delaware County. In 2014, Eddowes’ skydiving company, then known as Freefall Adventures, filed for Chapter 11 bankruptcy but said it would continue operating. Earlier that year, Eddowes and his wife, Agnes, the company’s owners, also filed for Chapter 13 bankruptcy, which allows individuals to restructure debt payments. Gilbert, of the Prosecutor’s Office, said Haaf was among about a half-dozen skydivers on the plane that took off from Cross Keys, and that they jumped in two groups. Neighbors said they saw some of those who landed safely in an area nearby walk to the scene where Haaf was found. According to Nancy Koreen, a spokesperson for the U.S. Parachute Association, in only about 1 in 1,000 cases does the main parachute not deploy properly. She said she could recall only a single incident in the last 30 years where a parachutist died because his parachute didn’t deploy. Experienced jumpers typically own their equipment, Koreen said. Other parachutists say that even if people packs their own gear, the skydiving company checks it, making sure it was done correctly. Spera and her husband, Angelo, who live at a busy intersection a block from the scene, were preparing Sunday dinner for their extended family when their daughter, Amy Lancetta, began screaming from the patio. Angelo Spera, 69, a retired teacher, discusses the death of a skydiver in his neighborhood. Lancetta, 40, of Hammonton, N.J., a speech therapist, watched in horror as Haaf fell to the ground, her parents said. She was still coping with the shock on Monday and was so distressed that she left work early. “She was hysterical. She started screaming, ‘Call 911, a skydiver just fell,’” said Angelo Spera, 69, a retired elementary-school teacher. Skydive Cross Keys in Gloucester County, New Jersey. Angelo Spera said the family rushed out of the house. Despite the warm weather, there were few people outside. They could see Haaf’s body on the ground surrounded by debris, including his shattered helmet and body camera. A Cooper University Hospital trauma nurse, who drove by the scene minutes after the incident, rushed to Haaf’s aid, the couple said. “She had tears in her eyes,” Angelo Spera said. May 26, 2002: Seth Karp, 28, a nationally ranked skydiver, dies from injuries. John Eddowes, owner of Freefall Adventures Skydiving School, says Karp tried to maneuver into a turn too close to the ground. Monroe Township police say Karp's parachute didn't open correctly. Sept. 2, 2004: Craig Kuske, 29, an experienced jumper who had been skydiving for 10 years, dies after his parachute failed to open. Gloucester County Medical Examiner's Office later determines that Kuske's blood-alcohol level was 0.16 percent, more than twice the legal limit for driving. July 4, 2005: Sara Loshe and Ron Samac, two veteran skydivers, die after their parachutes become entangled 150 feet above the ground. Sept. 10, 2006: Paul Joseph 3d, a skydiving instructor, and student Reed Michael Loeschke die in a tandem jump after their main parachute malfunctions. March 25, 2011: Carter Scott Shields, 45, the mayor of Rutledge in Delaware County, dies after plummeting into woods after his main parachute fails to open. An emergency chute activated automatically but failed to open completely. Nov. 21, 2012: Donald Lawrence Morozin, 62, a certified skydiver with more than 3,500 jumps, falls to his death after not attempting to open his parachute. The Gloucester County Prosecutor's Office says Morozin was "known to have hypertension and other medical issues that could cause him to pass out." April 20, 2014: Arkady Shenker, 49, a skydiver who had logged 350 jumps, dies on his third jump of the day, after becoming tangled in his parachute and failing to deploy a second parachute. April 7, 2019: Paul Haaf Jr., 54, a skydiver with more than 1,200 jumps, falls to his death in a residential neighborhood in Monroe Township. Skydive Cross Keys says Haaf's parachute was deployed upon exiting the airplane. According to the U.S. Parachute Association, about 21 people have died in skydiving accidents annually over the last nine years in the United States. In the 1970s, about 42 fatalities were recorded every year. The association said it recorded 13 fatal skydiving accidents nationwide last year out of roughly 3.3 million jumps, for a ratio of one fatality per 253,669 jumps. Staff writers Joseph A. Gambardello and Robert Moran contributed to this report.